"Let no one untrained in geometry enter." Motto over the entrance to Plato's Academy (quoted in Elias' commentary on Aristotle's Categories (Eliae in Porphyrii Isagogen et Aristotelis categorias commentaria, CAG XVIII.1, Berlin 1900, p. 118.13–19)). Aeì Libýē phérei ti kakón / kainón. "Libya always bears something evil / new", Aristotle, Historia Animalium. Compare Latin Ex Africa semper aliquid novi "From Africa always something new", Pliny. "A jackdaw is always found near a jackdaw"
Aeì koloiòs parà koloiôi hizánei. Similar to English "birds of a feather flock together." Aeì ho theòs ho mégas geōmetreî tò sýmpan. "An eagle's old age (is worth) a sparrow's youth". "Hippolocus begat me. I claim to be his son, and he sent me to Troy with strict instructions: Ever to excel, to do better than others, and to bring glory to your forebears, who indeed were very great ... This is my ancestry; this is the blood I am proud to inherit." "Not even the gods fight necessity" — Simonides, 8, 20. Andrôn gàr epiphanôn pâsa gê táphos. Latin: "The die has been cast"; Greek: "Let the die be cast." Julius Caesar as reported by Plutarch, when he entered Italy with his army in 49 BC. Translated into Latin by Suetonius as alea iacta est. "Man [is] the measure [of all things]"
Motto of Protagoras (as quoted in Plato's Theaetetus 152a). A word that only occurs once. The phrase originates from the way deity figures appeared in ancient Greek theaters, held high up by a machine, to solve a problem in the plot. "Stand a little out of my sun"
Used as the inscription over the Pump Room at Bath. "Heaven" is a foundational theological concept in Christianity and Judaism. "God's Kingdom" (Βασιλεία τοῦ Θεοῦ, Basileia tou Theou), or the "Kingdom of [the] Heaven[s]" was the main point of Jesus Christ's preaching on earth. The phrase occurs more than a hundred times in the New Testament. 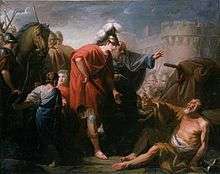 King Proetus dared not to kill a guest, so he sent Bellerophon to King Iobates, his father-in-law, bearing a sealed message in a folded tablet: "Pray remove the bearer from this world: he attempted to violate my wife, your daughter." Allegedly said by Nero of the poisoned mushrooms with which his mother Agrippina the Younger murdered Claudius. Gēraskō d' aíeí pollâ didaskómenos. "I grow old always learning many things." Solon the Athenian, one of the seven Sages of Greece, on learning. Athenian tetradrachm depicting goddess Athena (obverse) and owl (reverse); in daily use, Athenian drachmas were called glaukai, "owls"
E.g., coals to Newcastle, ice to the Eskimos. Aphorism inscribed over the entrance to the temple of Apollo at Delphi. Deimos and Phobos, the moons of Mars, are named after the sons of the Greek god Ares (Roman Mars): Deimos "horror" and Phobos "fear". 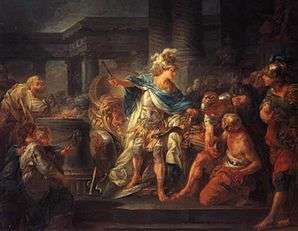 When Darius was informed that Sardis had been captured and burnt by the Athenians he was furious. He placed an arrow on his bow and shot it into the sky, praying to the deities to grant him vengeance on the Athenians. He then ordered one of his servants to say three times a day the above phrase in order to remind him that he should punish the Athenians. Diploûn horôsin hoi mathóntes grámmata. "Those who know the letters see double [twice as much as those who don't]." 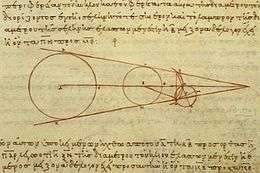 Attributed to Pythagoras. — Inscription in Edinburgh from 1954: ΔΙΠΛΟΥΝ ΟΡΩΣΙΝ ΟΙ ΜΑΘΟΝΤΕΣ ΓΡΑΜΜΑΤΑ. Dôs moi pâ stô, kaì tàn gân kīnā́sō. "Give me somewhere to stand, and I will move the earth". 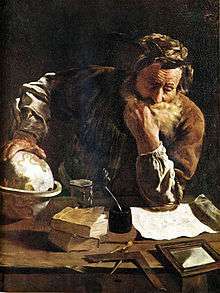 Archimedes as quoted by Pappus of Alexandria, Synagoge, Book VIII. "If you are fond of learning, you will soon be full of learning"
"There is only one omen, to fight for one's country"
The Trojan prince Hector to his friend and lieutenant Polydamas when the latter was superstitious about a bird omen. The omen was an eagle that flew with a snake in its talons, still alive and struggling to escape. The snake twisted backward until it struck the bird on the neck, forcing the eagle to let the snake fall. 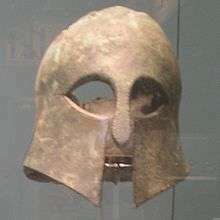 "Without things which [one can]not [be] without"
Fighting in the forefront of the Hellenes, the Athenians at Marathon brought low the Medes' gilded power. Epigram by Simonides on the tomb of the Athenians who died in the Battle of Marathon. Socrates, paraphrased from Plato's Apology. "On one side lay Scylla and on the other divine Charybdis"
Odysseus was forced to choose between Scylla and Charybdis, two mythical sea monsters, an expression commonly known as Between Scylla and Charybdis. 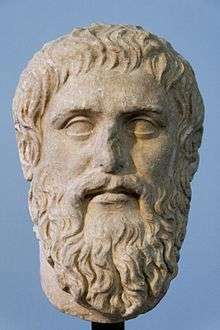 "When all of them, those gods who appear in their revolutions, as well as those other gods who appear at will had come into being, the creator of the universe addressed them the following" — Plato, Timaeus, 41a, on gods and the creator of the universe. While Archimedes was taking a bath, he noticed that the level of the water rose as he got in, and he realized that the volume of water displaced must be equal to the volume of the part of his body he had submerged. This meant that the volume of irregular objects could be measured with precision, a previously intractable problem. He was so excited that he ran through the streets naked and still wet from his bath, crying "I have found it!". Plato's definition of humans, latinized as "Animal bipes implume"
Maniot flag: Νίκη ἢ Θάνατος — ἢ τὰν ἢ ἐπὶ τᾶς "Victory or Death : Either With Your Shield or On It"
"Either [with] it [your shield], or on it"
Meaning "either you will win the battle, or you will die and then be carried back home on your shield". It was said by Spartan mothers to their sons before they went out to battle to remind them of their bravery and duty to Sparta and Greece. Hē phýsis oudèn poieî hálmata. "Nature does not make [sudden] jumps." 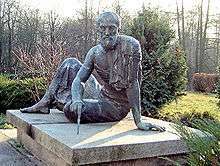 A principle of natural philosophies since Aristotle's time, the exact phrase coming from Carl von Linné. With these words, Julius Caesar described his victory against Pharnaces, according to Plutarch. Thálassa kaì pŷr kaì gynḗ, kakà tría. "Sea and fire and woman, three evils." Thalatta! Thalatta! from Xenophon's Anabasis. 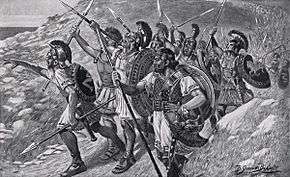 It was the shouting of joy when the roaming 10,000 Greeks saw Euxeinos Pontos (the Black Sea) from Mount Theches (Θήχης) in Armenia after participating in Cyrus the Younger's failed march against Persian Empire in the year 401 BC. Thánatos oudèn diaphérei tou zên. "Death is no different than life." Thales' philosophical view to the eternal philosophical question about life and death. "Physician, take care of yourself!" An injunction urging physicians to care for and heal themselves first before dealing with patients. It was made famous in the Latin translation of the Bible, the Vulgate. The proverb was quoted by Jesus, recorded in the Gospel of Luke chapter 4:23. Luke the Evangelist was a physician. "Jesus Christ, Son of God, Saviour." 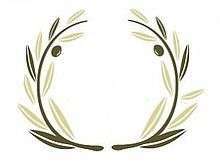 As an acronym: ΙΧΘΥΣ (Ichthys) — "fish". Iskhýs mou hē agápē toû laoû. Motto of the Royal House of Glücksburg. Ikhthỳs ek tês kephalês ózein árkhetai. "A fish starts to stink from the head." Greek equivalent of the English phrase "A fish rots from the head down"; attested in fifteenth century CE Paroemiae of Michael Apostolius Paroemiographus. "You too, child?" or "You too, young man?" On March 15, 44 BC, Julius Caesar was attacked by a group of senators, including Marcus Junius Brutus, a senator and Caesar's adopted son. Suetonius (in De Vita Caesarum, LXXXII) reported that some people thought that, when Caesar saw Brutus, he spoke those words and resigned himself to his fate. Among English speakers, much better known are the Latin words Et tu, Brute?, which William Shakespeare gave to Caesar in his play, Julius Caesar (act 3, scene 1,85). This means simply "You too, Brutus?" "From a bad crow, a bad egg"
I.e. like father, like son. "A bad man lives long"
"For the prettiest one", "To the most beautiful"
From the myth of the Golden Apple of Discord. Kátthane, Diagóra, ou kaì es Ólympon anabḗsē. "Die, Diagoras — you will certainly not ascend Olympus." A Spartan spectator to Diagoras of Rhodes, a former Olympic champion himself, during the 79th Olympiad, when his two sons became Olympic champions and carried him around the stadium on their shoulders. 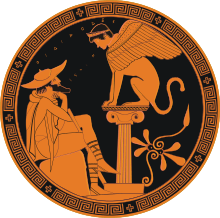 "Cretans always lie" — One of the earliest logical paradoxes attributed to Epimenides of Knossos known as the Epimenides paradox. 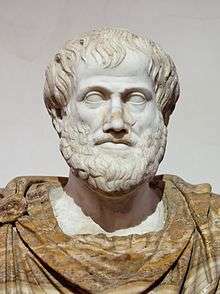 As Epimenides is a Cretan himself, it leads to the conclusion that the above statement is not true, hence the paradox. "possession for eternity" (Thucydides, History of the Peloponnesian War 1.22; "κτῆμά τε ἐς αἰεὶ [ktêma te es aieí]" in the original). "Lord have mercy" — a very common phrase in Greek Orthodox liturgies, and also used in Greek in the Roman Catholic Mass. An Epicurean phrase, because of his belief that politics troubles men and doesn't allow them to reach inner peace. So Epicurus suggested that everybody should live "Hidden" far from cities, not even considering a political career. Cicero criticized this idea because, as a stoic, he had a completely different opinion of politics, but the sentiment is echoed by Ovid's statement bene qui latuit bene vixit ("he has lived well who has stayed well hidden", Tristia 3.4.25). Plutarch elaborated in his essay Is the Saying "Live in Obscurity" Right? 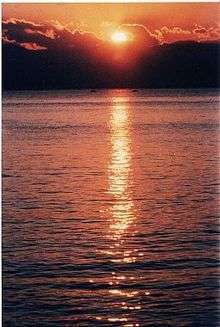 (Εἰ καλῶς εἴρηται τὸ λάθε βιώσας) 1128c. "I tell as I was told" or "I report reports"
Ἐγὼ δὲ ὀφείλω λέγειν τὰ λεγόμενα, πείθεσθαί γε μὲν οὐ παντάπασι ὀφείλω. Egṑ dè opheílō légein tà legómena, peíthesthaí ge mèn ou pantápasi opheílō. And I must tell what I am told, since I don't have to be persuaded completely. On occasions where neither too much nor too little is a good choice, as when eating or celebrating. Cleobulus, according to Diogenes Laertius. Mḕ moû toùs kúklous táratte. "Do not disturb my circles." The last words attributed to Archimedes (paraphrased from Valerius Maximus' Memorable Doings and Sayings). During the raid of Syracuse by the Romans, Archimedes was busy drawing circles. He was eventually attacked and killed by a Roman soldier. When there is no good option, one should pick the one that does the least harm. goddess Eris tossed the Apple of Discord "to the fairest". Paris was the judge of the prettiest one. 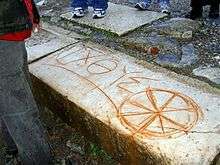 μηκέτι ὑδροπότει, αλλ' οἴνῳ ὀλίγῳ χρῶ διὰ τὸν στόμαχόν σου καὶ τὰς πυκνάς σου ασθενείας. Mēkéti hydropótei, all' oínōi olígōi khrô dià tòn stómakhón sou kaì tàs pyknás sou astheneías. Stop drinking only water, but take a little wine for your stomach and your frequent illnesses. King Leonidas of Sparta, in response to King Xerxes of Persia's demand that the Greek army lay down their arms before the Battle of Thermopylae. Latinized as Mysterium Fidei is a Christian theological term. “33 Again, you have heard that it was said to the people long ago, ‘Do not break your oath, but keep the oaths you have made to the Lord.’ 34 But I tell you, Do not swear at all: either by heaven, for it is God’s throne; 35 or by the earth, for it is his footstool; or by Jerusalem, for it is the city of the Great King. 36 And do not swear by your head, for you cannot make even one hair white or black. 37 Simply let your ‘Yes’ be ‘Yes,’ and your ‘No,’ ‘No’; anything beyond this comes from the evil one." 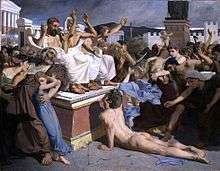 The traditional story relates that the Athenian herald Pheidippides ran the 40 km (25 mi) from the battlefield near the town of Marathon to Athens to announce the Greek victory over Persia in the Battle of Marathon (490 BC) with the word 'We have won' and collapsed and died on the spot because of exhaustion. "Wash the sins not only the face"
A palindromic inscription attributed to Gregory of Nazianzus, inscribed in Hagia Sophia and on many church fonts. In the Greek alphabet, the /ps/ sound is rendered by the single letter ψ (psi). Xénos ṑn akoloúthei toîs epikhōríois nómois. "As a foreigner, follow the laws of that country." Loosely, "Do in Rome as Rome does." Quotation from the works of Menander. 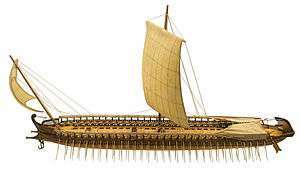 The "walls" of ships during the Persian Wars. 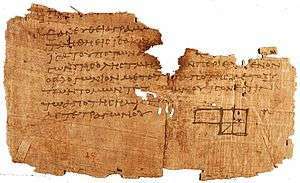 "what was required to be proved"
Used by early mathematicians including Euclid (Elements, 1.4), Aristotle (APo.90b34), and Archimedes, written at the end of a mathematical proof or philosophical argument, to signify the proof as complete. Later it was latinized as "QED" or the Halmos tombstone box symbol. From a story in Herodotus (6.129), in which Hippocleides loses the chance to marry Cleisthenes' daughter after getting drunk and dancing on his head. Herodotus says the phrase was a common expression in his own day. Charon's obol. 5th-1st century BC. All of these pseudo-coins have no sign of attachment, are too thin for normal use, and are often found in burial sites. Ouk àn labois parà toû mē ekhontos. Menippus to Charon when the latter asked Menippus to give him an obol to convey him across the river to the underworld. Odysseus to Polyphemus when asked what his name was. (Homer, Odyssey, ix, 366). 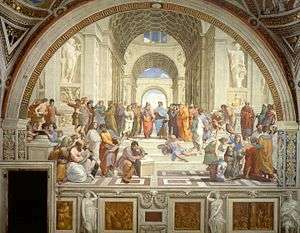 "All is flux; everything flows" – This phrase was either was not spoken by Heraclitus or did not survive as a quotation of his. This famous aphorism used to characterize Heraclitus' thought comes from Simplicius, a Neoplatonist, and from Plato's Cratylus. The word rhei (cf. rheology) is the Greek word for "to stream"; according to Plato's Cratylus, it is related to the etymology of Rhea. "ever seeking the truth" — Diogenes Laertius, Lives of Eminent Philosophers — a characteristic of Pyrrhonism. 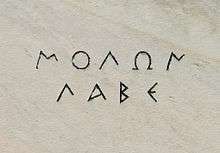 An abbreviated form, ζητεῖν τὴν ἀλήθειαν ("seek the truth"), is a motto of the Geal family. Papaí, Mardónie, koíous ep' ándras ḗgages makhēsoménous hēméas, hoì ou perì khrēmátōn tòn agôna poieûntai allà perì aretês. "Good heavens! Mardonius, what kind of men have you brought us to fight against? Men who do not compete for possessions, but for honour." "(There is) learning in suffering/experience", or "Knowledge/knowing, or wisdom, or learning, through suffering". 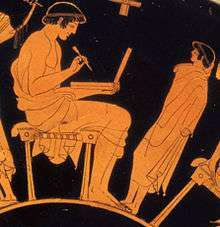 The variant πάθος μάθος means "suffering is learning/learning is suffering." "A bad neighbor is a calamity as much as a good one is a great advantage." The complete text of this fragment by Heraclitus is: πόλεμος πάντων μὲν πατήρ ἐστι, πάντων δὲ βασιλεύς, καὶ τοὺς μὲν θεοὺς ἔδειξε τοὺς δὲ ἀνθρώπους, τοὺς μὲν δούλους ἐποίησε τοὺς δὲ ἐλευθέρους (War is the father of all and the king of all; and some he has made gods and some men, some bond and some free). "With fists, kicks, and bites"
Πύξ "with fists", λάξ "with kicks", δάξ "with bites"
Epigram describing how laypersons were chased away from the Eleusinian Mysteries. 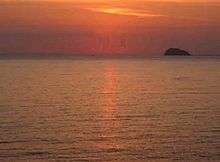 This phrase occurs frequently in the Homeric poems referring to Eos, the Titanic goddess of the dawn. Eos opened the gates of heaven so that Helios could ride his chariot across the sky every day. "Hasten slowly" (cf. Latin festina lente), "less haste, more speed". According to Suetonius the phrase "σπεῦδε βραδέως, ἀσφαλὴς γάρ ἐστ᾽ ἀμείνων ἢ θρασὺς στρατηλάτης" was a favorite of Augustus as he often quoted it. Sỳn Athēnâi kaì kheîra kinei. "Along with Athena, move also your hand" — cf. the English "God helps those who help themselves." Tà mén aplanéa tōn astrōn kai tón halion ménein akinēton, tàn dé gân periféresthai peri tón álion. "The fixed stars and the Sun remain unmoved, while the Earth revolves about the Sun" — Archimedes' description of the heliocentric model in his work The Sand Reckoner, based on the work by Aristarchus of Samos. Tà pánta rheî kaì oudèn ménei. "All things move and nothing remains still, and you cannot step twice into the same stream". Tád' estì Pelopónnēsos, ouk Iōnía. "Here is Peloponnesus, not Ionia" — Inscription written on a pillar erected by Theseus on the Isthmus of Corinth facing toward the West, i.e. toward the Peloponnese. Tád' oukhì Pelopónnēsos, all' Iōnía. "Here is not Peloponnesus, but Ionia" — inscription as per above, but toward East, i.e. toward Attica. Tí dýskolon? Tò heautòn gnônai. Ti estin ho mian ekhon phōnēn tetrapoun kai dipoun kai tripoun ginetai? "What is that which has one voice and yet becomes four-footed and two-footed and three-footed?." — The famous riddle of the Sphinx. Oedipus solved the riddle correctly by answering: “Man: as an infant, he crawls on fours; as an adult, he walks on two legs and; in old age, he uses a walking stick”. Tí eúkolon? Tò állōi hypotíthesthai. Tí kainòn eiē tetheaménos? Géronta týrannon. Tí koinótaton? Elpís. Kaì gàr hoîs állo mēdén, aútē paréstē. Tí tákhiston? Noûs. Dià pantòs gàr trékhei. Tí próteron gegónoi, nùx ē hēméra? núx, miâi hēmérai próteron. Tò gàr hēdý, eàn polý, ou tí ge hēdý. "A sweet thing tasted too often is no longer sweet." Tò dìs examarteîn ouk andròs sophoû. "To commit the same sin twice [is] not [a sign] of a wise man." "It's impossible to escape from what is destined." Unigenitus (named for its Latin opening words Unigenitus dei filius, or "Only-begotten son of God") is an apostolic constitution in the form of a papal bull promulgated by Pope Clement XI in 1713. Moriamur, et in media arma ruamus "Let us die, and charge into the thick of the fight". 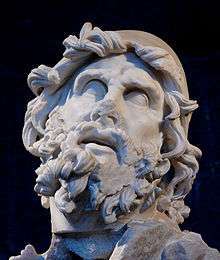 The Phoenician prince Cadmus was generally accredited by Greeks such as Herodotus with the introduction of the Phoenician alphabet several centuries before the Trojan war, circa 2000 BC. "Those who make quick decisions are not safe." "The good/beautiful things [are] difficult [to attain]." 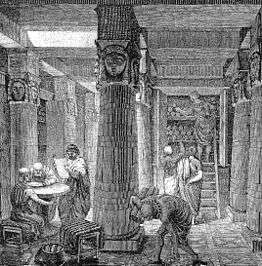 The Library of Alexandria, also known as the Great Library in Alexandria, Egypt, was once the largest library in the world. 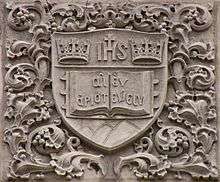 The phrase is used in reverse as ἰατρεῖον ψυχῆς as a motto for Carolina Rediviva, a university library in Uppsala, and is echoed in the motto of the American Philological Association, "ψυχῆς ἰατρὸς τὰ γράμματα" ("literature is the soul's physician"). Ô xeîn’, angéllein Lakedaimoníois hóti têide / keímetha toîs keínōn rhḗmasi peithómenoi. "Stranger, tell the Spartans that here we lie, obedient to their laws." 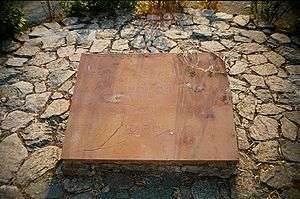 Epitaph, a single elegiac couplet by Simonides on the dead of Thermopylae. Translated by Cicero in his Tusculan Disputations (1.42.101) as «Dic, hospes, Spartæ nos te hīc vidisse jacentīs / dum sanctis patriæ legibus obsequimur» (often quoted with the form iacentes). ↑ Henri-Dominique Saffrey, "Ἀγεωμέτρητος μηδεὶς εἰσίτω. Une inscription légendaire." In: Revue des études grecques 81 (1968, pp. 67–87), p. 81. ↑ The word πλατυώνυχον however sounds like πλατωνικόν, i.e. "the platonic thing". See The stranger’s knowledge: Political knowledge in Plato’s statesman by Xavier Márquez, University of Notre Dame, 2005, p. 120. ↑ Ernst Ludwig von Leutsch, ed. (1851). "Μιχαήλου Ἀποστόλου τοῦ Βυζαντίου Συναγωγὴ Παροιμιῶν καὶ Συνθήκη". Corpus Paroemiographorum Graecorum. 2. Göttingen. p. 466. ↑ Diogenes Laertius, Lives of Eminent Philosophers, Κλεόβουλος; also quoted in Stobaeus, Florilegium 3.1.172. ↑ Alex Preminger, Terry V.F. Brogan, and Frank J. Warnke, The New Princeton Encyclopedia of Poetry and Poetics, 3rd ed., Princeton University Press, 1993, ISBN 0-691-02123-6, p. 874. ↑ Herodotus, Histories, Book V, 58.